When this film started, I had no way of knowing how much I would get wrapped up in it! (I had a similar experience with the book too.) The story is excellent, the acting is amazing, but it was the interesting British and Swedish decorative arts and parallels to Alfred Hitchcock’s Vertigo (one of my favorite things to talk about) that made me into a full-on fanatic about this movie. First, let’s start with the decorative arts. This movie is filled with design. (Oh, and I just want to say that I’m not going to spoil anything …the story is too good for me to deprive anyone of that suspense!) The story revolves around a wealthy Swedish family, the Vangers, so of course they live in some fabulous buildings. The family’s main home, is so grand and austere, you would think they were royalty. Erstaviks castle in Nacka Municipality, Sweden, that played the part of the Vanger family home. When we are introduced to the Vanger son’s home we get a glimpse of modern design. Martin Vanger’s home was supposed to have been built in 1979, and is unlike any other space we visit in the movie. The plot centers around a journalist who is brought in to investigate a long unsolved the murder of one of the Vanger children, Harriet Vanger. His investigation begins as he is hired by the patriarch of the family, Henrik Vanger. Henrik received a framed pressed flower every year for his birthday, just as Harriet had given him, every year, when she was alive. Every year for his birthday, Henrik receives a pressed flower in a frame. Uhh ...he's pretty old. While researching the family and unsolved crime, the journalist, Mikael Blomqkist, stays on the family estate in a small cabin, down the road from Martin Vanger. It is here that we see some historic designs. The wallpaper in this cabin is by the Swedish (born Austrian) architect and designer, named Josef Frank (1885-1967). Frank’s work in architecture, and especially in furniture, textile and wallpaper design had a profound impact on the Swedish Style of the mid 20th century. But this so-called Swedish style did not begin with Frank. It began around the time of his birth in the 1880s with William Morris (1834-1896) in England. As William Morris shaped the public taste of Victorian England, he influenced a movement that was spreading across all of Europe. The Arts and Crafts Movement stressed the importance of handmade craftsmanship and an appreciation for nature. (To sum up the movement in far too few words!) These beliefs can be clearly scene in his wallpaper. Creating in the traditional style, William Morris’ wallpapers were made from vegetable dyes and used the hand woodblock technique. William Morris and the British Arts and Crafts Movement directly influenced the Swedish painter and interior designer, Carl Larsson (1853-1919). He, in following Morris (he was 20 years Morris’ junior), created an artistic house. Larsson and his wife, Karin, filled their home with their artistic touches. Where previously only the “fine arts,” painting and sculpture, would have been used to decorate a house, they painted and decorated walls, furniture and textiles. The Larssons also documented their entire house in the book, Ett hem, published in 1899. Their use of Swedish folklore and their belief in the beauty of nature can be seen in every print Larsson put into the book. Here is another view of the stove in the drawing room, with painter, carpenter and Carl Larsson himself in the mirror. Okay, okay, back to the movie!! So, with that brief history of Morris and Larsson in mind, imagine my excitement, when Blomkvist walks into his cabin and we see a view of the paper covering the walls. Josef Frank would have been familiar with Larsson and Morris’ work. And as a last generation of the Arts and Crafts Movement, he held on to the love of brightly colored, stylized natural motifs and it shines here brightly in his botanical print wallpaper with a print called Vårklockor. Josef Frank's wallpaper pattern, Vårklockor, from the 1940s. It was manufactured by the Norrköping Wallpaper Factory. Another view of Blomkvist's cabin, with Josef Frank's wallpaper. There is another scene in which we see this wallpaper, but this time it has a dark background. Also, the bench in this scene caught my eye. Once again we see Frank's Vårklockor pattern, along side an Eastlake style bench. Up close, as seen below, the wallpaper is very vibrant. But, I like the aged look it has in the film. Still, the pattern is distinct, and it is certainly Josef Frank’s design. Josef Frank's Vårklockor pattern wallpaper with a black background. The bench, in the picture above, where Lisbeth Salander is seated, will again take us back to England. And, I can’t imagine how I made it this far into my story without mentioning Lisbeth! She is a fantastic heroine, and I think one of my favorites. Curiously enough, one of Carl Larsson’s daughters was named Lisbeth, and is featured in the prints of Ett hem. ( I love little coincidences like that.) I can’t say for certain whether the bench is Swedish or English, but it definitely finds its provenance in England. As part of the firm, Morris, Marshall, Faulkner & Co., designer and architect, Philip Webb (1831-1915), created the Morris Adjustable Chair in 1866. 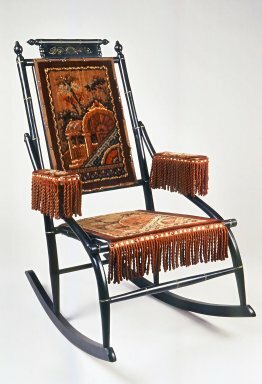 The "Morris Adjustable Chair" from Morris, Marshall, Faulkner & Co., by Philip Webb, 1866. Notice the similarity in the chair rail, arms and legs of the Morris Adjustable Chair to the bench Lisbeth sits on …and yet there are differences. The bench takes its slimmer silhouette from the Firm’s Sussex line. The Firm's Sussex chair line, designed 1865. Yet, that still doesn’t quite cover it. I think the bench we see in the movie was very much influenced by Charles Eastlake (1836-1906). And his influence too would have been felt by Carl Larsson. Eastlake, an English architect and designer was William Morris’ contemporary. His book, Hints on Household Taste, published in Great Britain in 1868, presented the idea that the decor of a home should have a continuity in style. His ideas not only help spread the word of the Arts and Crafts Movement, but it would have influenced Larsson in the decorating of his family home too. Finally, the parallels to Alfred Hitchcock’s Vertigo gave me chills! Not in a, “oh I’ve already seen this but it’s still great” kind of way, but in a way where new life was brought into a mystery and love story so dark, it chills you to your core beliefs. Henrik Vanger bears a resemblance to Jimmy Stewart’s main character in Vertigo, Scottie Ferguson. And just like Scottie, Henrik finds himself so entranced with a dead woman, his niece, that he has put his life on hold trying to find her and bring her back to life. It is the botanical prints that he loved so dearly as a gift from Harriet that now haunt him on a yearly basis …and also offers the production designers of this movie a brilliant reason to incorporate such historically charged botanical wallpaper into the set design. There is a necklace that plays a role in the story of The Girl with the Dragon Tattoo, and while it is not as central to the story as the necklace in Vertigo is, it is still a game changer. The necklace Cecelia (Henrik’s niece) is wearing at one point is the same necklace that Harriet is wearing in a photograph, this brings back Michael’s memory, just as Carlotta’s necklace brings back Scottie’s. Michael is reminded of his childhood, when his nanny was the same Harriet Vanger that he is now searching for, and two women’s identities are woven together into one. I have just stumbled across your blog by doing a google image search for “martin vanger home interior”. Great stuff. Do you have any more images of the interior of Martin’s home? I am looking for some as a jumping off point for a client’s new build. Are you looking for Martin’s house in the Swedish or American version? I just saw the American movie the other night, and his home was fantastic in that movie too.